Linkin Park played at Summerfest in Milwaukee on June 30th, 2015. What a great night for a concert! As one of the lucky LPU members to win a spot for the meet and greet, I worked my way over to Lorenzo to wait for my moment with the band. A small group of fans and myself went to a small room where we were given our’rules’ and instructions for the meet and greet. While waiting for Linkin Park to arrive I mingled with some fans near me. Listening to people’s stories how they became fans, their most memorable moments, favorite songs etc., is so interesting and also makes me so proud to be part of this ‘family’. When the band arrived they quickly started talking with everyone as they signed items. The band are the nicest, sweetest guys ever! Even if it’s a short conversation, you felt so comfortable with them, like you’re talking with a close friend. If they were nervous, I couldn’t tell but I was! I have a LP tattoo and I wanted the band to sign my leg. Joe was the first to stop by so I asked him if he could sign my leg, but before he signed it he teasingly kept asking me ‘here?, here?’, while pointing to different spots on my leg. It made me chuckle because I had my leg in the air waiting for him to sign it. Rob, Phoenix and Brad also came by and signed my tattoo and made small talk. Soon Chester stopped by and signed my leg. I thanked him and he continued to the next fan but suddenly he came back to me and asked me if I had something else he could sign in case the signature rubs off my leg. I scurried to find my phone case but he grabbed my laminate and signed it while he told me all the things he doesn’t like to sign because it’s hard to get a good signature on it for fans. At this point he could have told me to go stand in a garbage can and I would, I was that in awe of him! I thanked Chester again and gave him a high five. However, I have to say, besides Chester, Mike was the most memorable. When he got to me he stopped and looked around looking for my item to sign. Again, I lifted my leg and nervously asked for his signature. He started to sign his name and then said, ‘wait’ and got down on his knee and put my foot on his knee and finished his signature. I melted! How awesome and sweet is that! After meet and greet I worked my way back to my seat. When Linkin Park came out and started playing Papercut, the crowd jumped to their feet and exploded in a deafening roar. You could hear the crowd singing right along with Chester and Mike. At one point Mike joked that he got distracted and lost his spot due to the crowd being so energized singing the songs. A few favorites of the night were ‘a Line in the Sand’, ‘One Step Closer’, ‘Numb’ and ‘Bleed It Out’. When ‘ Leave Out All The Rest’ and ‘Shadow of the Day’ were played, the flashlights came out lighting up the amphitheater in a wave of white light. Joe Hahn performing his solo got the crowd pumped up before breaking into another favorite, ‘New Divide’. When Mike started in on ‘Remember the Name’ the crowd erupted with screams, hands went up to pump their fist to the beat of the music. They rappped along with Mike and as they screamed for more, Mike started ‘Welcome’ which made the crowd yell louder with excitement. 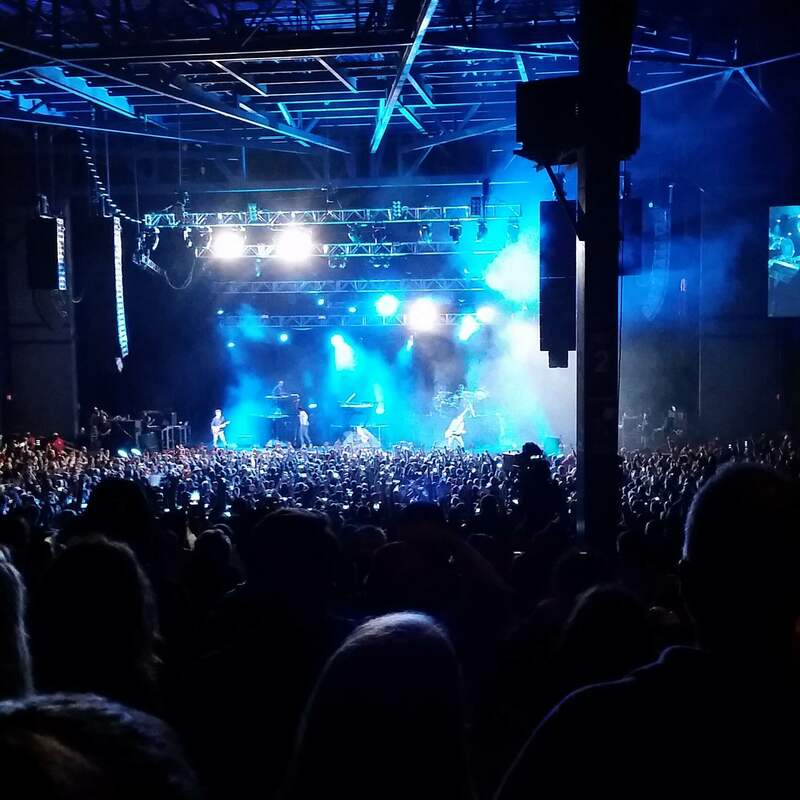 You have recently been at a Linkin Park show and want to share your concert experience with the LPFC readers, too? Find out HERE how to become one of our fan reviewers! This entry was posted in 2015, Blog, Fan Reviews, LP Underground and tag linkin park, review. What tattoo did she have? Good arrow LPFC. New LPU/JJ Tat for me tomorrow!